Fun! 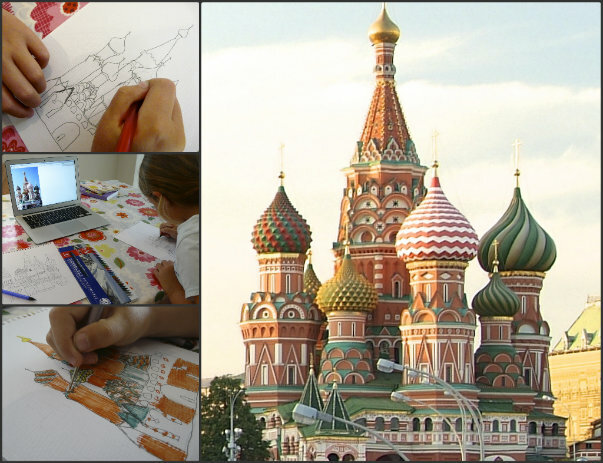 Russia is a country I’ve wanted to delve into for years (unfortunately I let the girls choose a few times – threw me off 🙂 – I really like your alphabet comparisons, and the cathedral drawings look beautiful! I get such a kick out of John Green’s crash courses. I love this study. You have so much fun and learn so at much the same time. I love the art work, and the language study especially. Thank you, Phyllis. We love doing language studies as part of history and geography. 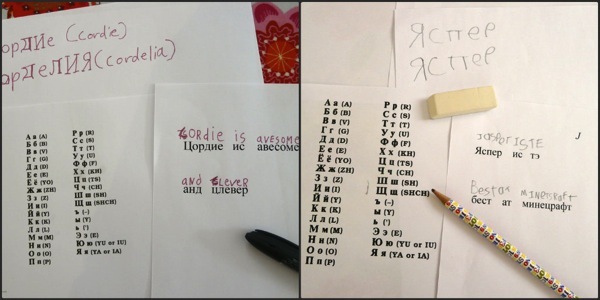 I think it’s such a fun and easy way to introduce the children to other scripts and languages. Wow, thanks for the research! 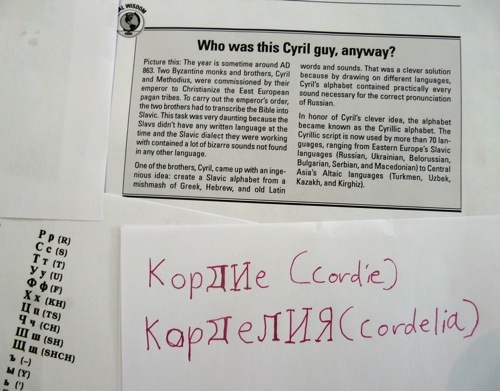 The history of the Cyrillic letters is absolutely fascinating. 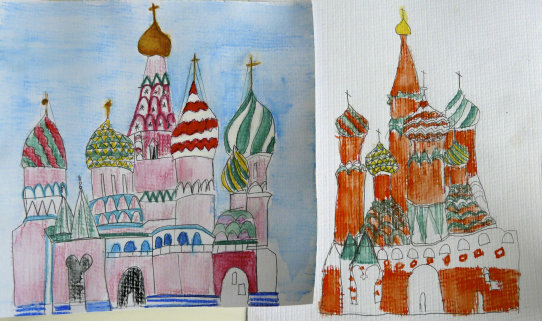 I love your drawings of the cathedral — they’re very well done! I know so little about Russia, and now your post has inspired me to learn more about it. Thank you, Hwee! 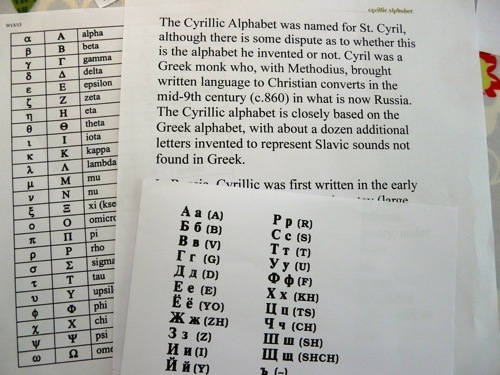 Yes I was fascinated to discover that there actually was a Cyril, and how he formed the alphabet! Interesting, I didn’t know that’s how the alphabet came to be. This looks like a great study. It’s interesting that the Vikings played a significant role in Russian history as they did in British, and French history as well. I’m booking marking this because the language activity looks fantastic. Thank you, Julie. Yes I had no idea the Vikings had got so far either. I think historians debate exactly how many Vikings came, since Russian sounds much more Slavic than Scandinavian, but it is certainly a strong theory. Perhaps when my kids are older we will come back and look into the subject more deeply. I was really hoping you’d stop by, Elena – thank you! How fascinating about the translation of historical and classical names. J(8) will enjoy looking at his name again in the light of what you say. I studied a bit of Russian history for A level (Peter and Catherine the Great, mainly) but I would love to know more. You have such an interesting country. If you can recommend any good books either for adults or kids about Russia and its history I would be really interested. You are an expert at integrating languages into whatever country you are studying! It is so much a weakness of mine. When I went to Paris, I didn’t speak one word of French even though I have GCSE French. How pathetic is that?! Love your children’s pictures too! I think I might be a bit addicted to languages, actually. The other evening I was feeling slightly out of sorts and ten minutes doing Duolingo German cheered me right up! Still, there are probably worse addictions! WOW I never knew 1/2 that info on Russia! Thanks! Those drawings are great..Love the detail. I love the Kremlin drawings 🙂 I can remember a few years ago, going through a time where I did a lot of reading about Russia. Thank you, Rebecca! It’s a fascinating country, isn’t it? I think we’re going to be doing some deeper reading, too. Did you enjoy any particular books? Apart from Russian culture oozing from his stories they sound quite up-to-date even today and unlike other stories written at that time – non patronizing (children would always appreciate this:-). This is the favorite in our house (but in Russian). The illustrations are fantastic! This might make a great unusual present for a 4-5 year old. As for the reading for adults I quite enjoyed reading Nicolas and Alexandra myself. This is about the last Russian Czar and his family. Although written by an American writer, there is a thorough research behind it, interestingly enough, inspired by the the fact that the author’s son had the same disease as Nicolas’s only son. Maybe that is why he was so passionate about it. The book is very detailed history-wise, but also very personal and I really liked the balance. Sorry once again for the length of this)). Just understandably get carried away as it is about my home country I love and miss… Good luck with your studies! Thank you so much, Elena! What an excellent selection of resources. It’s so valuable having recommendations from a native – you know you’re getting an authentic flavour of a country. I’ll let you know how we get on with the books. I love the idea of Leo Tolstoy’s school. He’s now up there on my unschooling heroes list! What a fun study. I love the artwork. Your kids did great. Happy homeschooling to you! We love homeschooling. Thanks for stopping by and thank you for the comment on my daughter’s cute crocheting projects. I too think they are really nice!! That’s a wonderful unit study on Russia. We are actually studying about Russia too, but we are now in high school levels of homeschooling so it doesn’t look quite as fun as your present studies. I was so impressed by her crocheting! I’m looking forward to coming back to study Russia again later. I think what you miss in hands-on projects with teenagers, you probably make up for in satisfaction of being able to cover a topic in greater depth. Great post! I love peeking in on what other homeschoolers choose to study! Thank you, Carol! I know what you mean, I think I saw this on someone’s blog a couple of years ago and I finally found the moment for us to do it! I found your post at Hip Homeschool Moms. I’m pinning it to my Geography board 🙂 Thank you for sharing!